Organizations are the oldest and most established social structures created by individuals. For organizations consisting of at least two individuals, man is an indispensable element. Psychological and abstract concepts are gaining importance in every environment and structure where human beings exist. Indeed, labor is not a mechanical or financial commodity. Organizational commitment, one of the concepts gaining importance in the process of management behavior, is the sense of belonging and attitudes towards employees' organizations. It is desirable that the loyalties of employees are strong and developed. Thus, the employees will identify themselves with their organizations and will nominate themsevles to their organizations. It is seen that the issue of organizational commitment, which has not been considered in the public sector in our country before and which has not been evaluated much, has gained importance in recent years. Efficiency and efficiency debates, which have been intensified in recent years for public institutions, have an important role in this. In this context, it is aimed to analyze which level the organizational commitment of employees of emergency health services in the Ministry of Health restructured in this study with the date of 15 08 2017 and numbered 694. For this purpose, the organizational commitment questionnaire developed by Allen and Meyer was applied to public employees working in the Bartın 112 Emergency Health Services Stations universe. As a result of the survey, the organizational commitment in the employees working at Bartın Emergency Health Care Service Stations was realized as 3,52 in the emotional attachment dimension, 3,61 in the continuing attachment dimension and 3,24 in the normative attachment dimension. Allen, N.J. ve Meyer, J.P. (1990), “The Measurement and Antecedents of Affective, Continuance and Normative Commitment to the Organization”, Journal of Occupational Psychology, Vol.63, 1-18. Balay, R. (2000), Yönetici ve Öğretmenlerde Örgütsel Bağlılık, Nobel Yayın Dağıtım, Ankara. Brown, B.B. (2003), Employees’ Organizational Commitment and Their Perception of Supervisors’ Relations-Oriented and Task-Oriented Leadership Behaviors, Unpublished Dissertation, Falls Church, Virginia. İnce ve Gül (2005), Yönetimde Yeni Bir Paradigma: Örgütsel Bağlılık, Birinci Baskı, Çizgi Kitabevi Yayınları, Konya. Mathieu, J. E. ve ZAJAC, D.M. (1990), “A Review And Meta- Analysis Of The Antecedents, Correlates, And Consequences Of Organizational Commitment”, Psychological Bulletin, Vol.108, No.2, pp. 171-194. Meyer, J. P. and Allen, N.J. (1991), “A Three Component Conceptualization of Organizational Commitment”, Human Resources Management Review, Vol.1, pp. 61-89. Meyer, J.P. ve Allen N.J. (1997), Commitment in the Workplace; Theory, Research, and Application, Sage, Thousand Oaks, Ca. Mowday, R.T., Porter L.W. ve Steers R.M. (1982), Employee Organization Linkages, Academic Press, ss.365, New York. O’Reilly, C. ve Chatman, J. (1986), “Organizational Commitment and Psychological Attachment: The Effect of Compliance, Identification and Internalization on Prosocial Behavior”, Journal of Applied Psycholog, Vol. 71, No. 3, ss. 492-499. Steers, R. (1977), “Antece De Nts And Outcomes Of Organizational Commitment”, Administrative Science Quarterly, Vol. 22, pp. 46-56. Wiener, Y. (1982), “Commitment in Organizations: A Normative View”, Academy of Management Review, Vol:7, No:3, 418-428. ISNAD Ak, Murat . "Yapısal Değişim Ekseninde Kamuda Örgütsel Bağlılık: Acil Sağlık Hizmetleri İstasyonlarında Ampirik Bir Analiz". 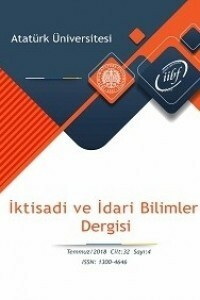 Atatürk Üniversitesi İktisadi ve İdari Bilimler Dergisi 33 / 1 (February 2019): 179-201.